In this installment of my 2013 OLJ Kitchen Series, I am sharing cabinet organization. I reorganized the contents of the kitchen cabinets in our family vacation home in Utah to be more user friendly. Due to the deep nature of the two main floor cabinets, items previously had a tendency to get lost in the back, making them difficult to locate. 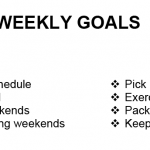 By organizing items by type, size, and frequency of use, I was able to establish a more effective arrangement without the use of organizational aids such as bins and dividers. The main cabinet on the left side of the sink is home to all of our most frequently used stovetop cooking items. I started by removing all of the cabinet’s contents, including a food processor I wanted to relocate to a higher cabinet for safety reasons. I gave the cabinets a thorough cleaning and then put all of pots and pans back, this time arranging them by type, size, and frequency of use for an optimized storage solution. I also took all of the lids that were previously stored in a drawer next to this cabinet and placed them with their proper pots. Not only does this create less rummaging about when we want to cook something, but it also frees up a large drawer in the kitchen for other storage. I made sure to place the larger pots in the back with the smaller, more frequently used ones in front with their handles facing out. The pans on the upper shelf are stacked according to size and use and other cooking aids such as steamers are tucked to the side since they are not used as often. There is quite a bit of room in these cabinets beyond the immediately reachable area that I left pretty bare, but would be great for large-sized rarely used items. We don’t need the space at the moment, but it’s always nice to have room to grow, especially in the kitchen. The other main floor level cabinet on the right side of the sink in the Utah house kitchen houses many of our most useful cooking aids, including mixing bowls, strainers, and ceramic and glass cooking dishes. It also is home to some items we rarely use, including specialty baking tins, cake pans, and empty jars. This cabinet in its former state was a huge jumbled mess of things! It was always a challenge to find what we wanted to. Sadly, this picture does no justice to the great improvements made by taking just a few moments to organize (I recommend watching the video for a better look). Again, I started by removing everything, cleaning the shelves, and then putting everything back based on type, frequency of use, and size. I tucked all of the baking odds and ends into the hard to access deep corners of the cabinet, and arranged the items we use on a more daily basis front and center. Even though the cabinet is tall enough to stack items, I tried to limit how many bowls and such were stacked to maintain a streamlined arrangement. I am very happy with the results of organizing these two main floor cabinets. It’s amazing what can be accomplished by taking just a few minutes to establish a sense of order in such high traffic storage areas! I decided to move some of our more dangerous kitchen appliances which were previously stored in floor level cabinets up higher for safety reasons. With my sister-in-law’s baby, Grace, in the picture now, it wouldn’t be safe to have such appliances like the food processor, coffee grinder, and blender on the floor where curious little ones could easily reach in and hurt themselves. 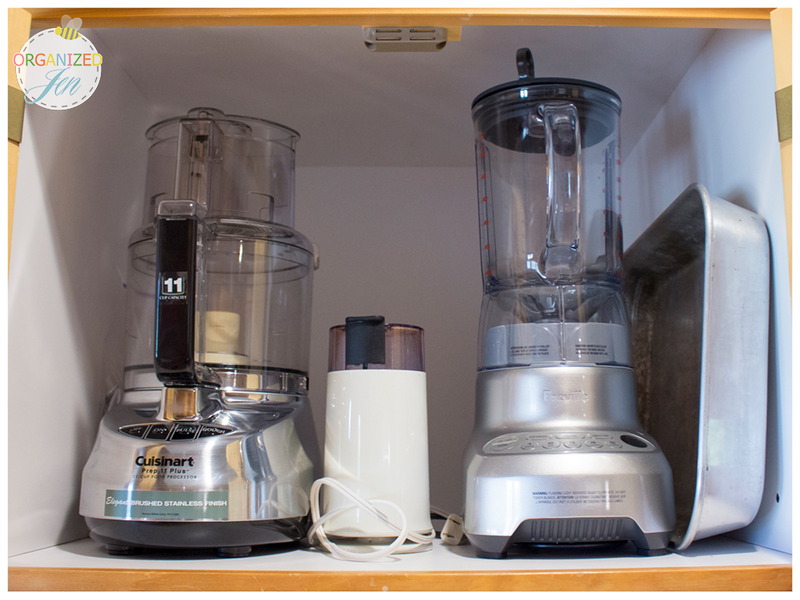 Luckily, we have more space than things to store in this kitchen, and I was able to clear out vases we never use from a conveniently located cabinet just over the microwave to house these appliances. They’re still easy to access without a ladder, but safely out of reach of little ones. Lastly, I wanted to touch up the arrangement of our cabinets that house all of our plates, bowls, mugs, and glasses. Like all of the other cabinets, I chose to organize these items in terms of frequency of use and size. 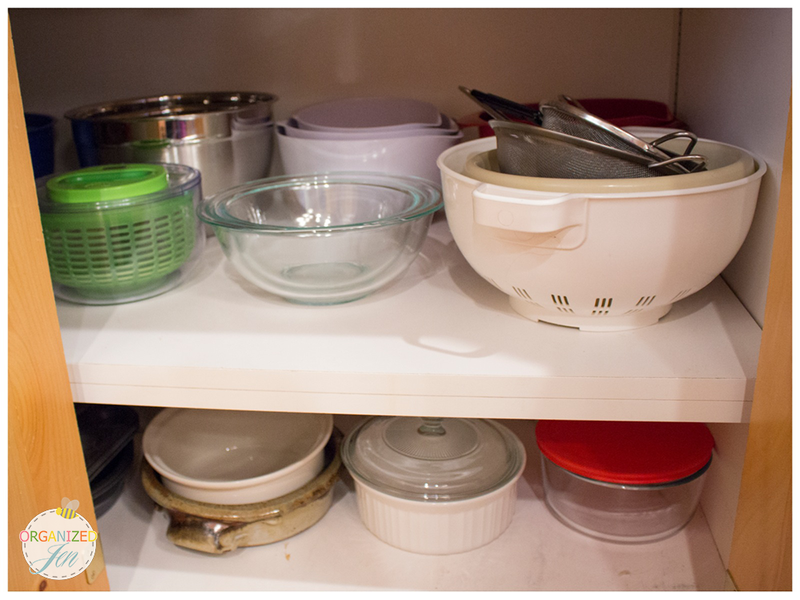 Plates and bowls are stored on the lower two shelves of one cabinet with mugs on the top. 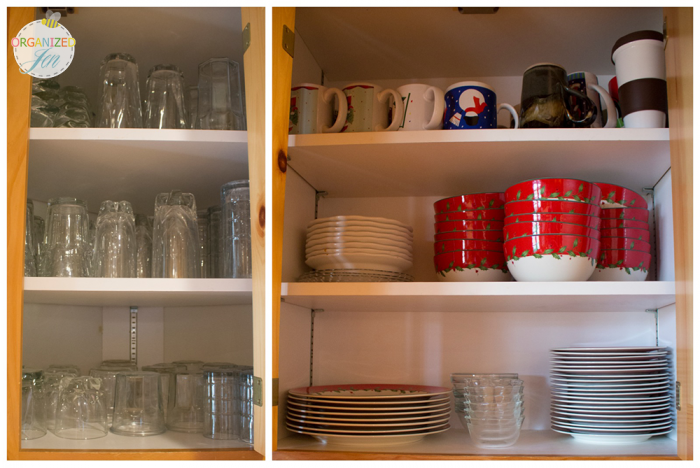 Our massive glass collection is separated per shelf by size in another cabinet, with smaller glasses on the bottom, medium on the middle, and larger glasses and ice cream dishes on the top. Stay tuned for a look at the under the sink organization in this kitchen, coming up next in the series. 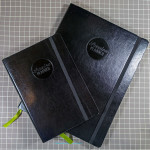 Are those mugs extra ones or ones you’ll be using daily over the holidays? I was curious because I’m both a tea lover and a little on the shorter side, so to me those look awfully high up. 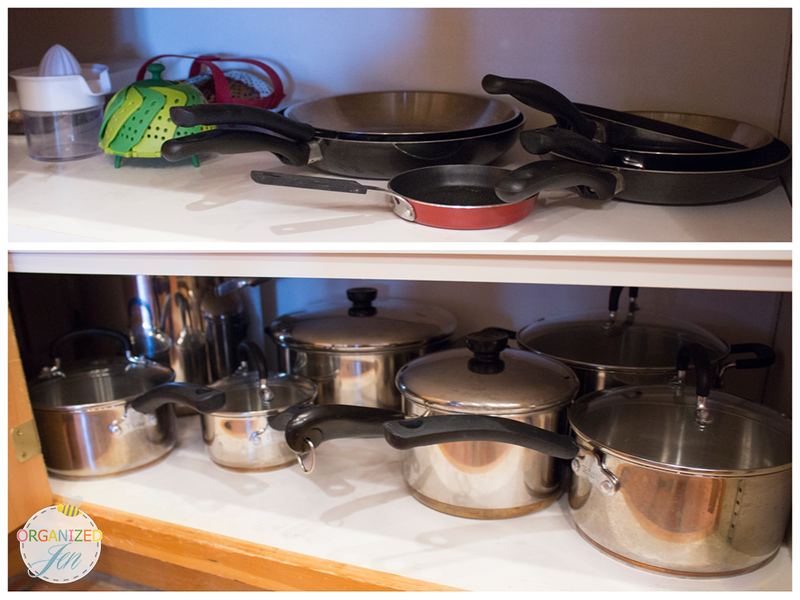 Your clean shelves of pots and pans are excellent inspiration to be more organized in the kitchen! I’m 5’4″ and can reach them easily. No one in our family seems to have trouble. If they did we would reorganize for them to be easier to reach for everyone. Great post. I recently did an overhaul of my pantry. 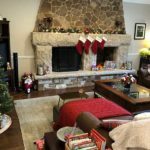 I’d love for you to check it out, as well as other home type things on my site. It looks beautiful! Love the containers 🙂 TFS!